Schwartz, Thomas F., "'An Egregious Political Blunder': Justin Butterfield, Lincoln and Illinois Whiggery", (Journal of the Abraham Lincoln Association, 1986). Tegeder, Vincent G., Lincoln and the Territorial Patronage: The Ascendancy of the Radicals in the West, (The Mississippi Valley Historical Review, June, 1948). Hesseltine, William B., Abraham Lincoln and the Politicians, (Civil War History, March 1960). “Yes, yes,” said Mr. Lincoln, without stirring. Mr. Lincoln’s notions of patronage changed with time. As Lincoln scholar Edward J. Kempf observed: “As a Whig, and even more so characterologically, he opposed the political philosophy of President Andrew Jackson ‘to the victors belong the spoils,’ as the culture of party favoritism and official incompetence at the expense of the people.”6 Mr. Lincoln began to understand that parties were built on patronage as well as principles. As President-elect, he tried to delay the crush for offices in his Administration, but a New York journalist reported in mid-November: “The rush for office has already commenced.” He quoted President-elect Lincoln as saying: I have made up my mind not to be badgered about those places. I have promised nothing, high or low, and will not. By-and-by, when I call somebody to me in character of an advisers, we will examine the claims to the most responsible posts, and decide what shall be done. As for the rest, I shall enough to do without reading recommendations for country postmasterships; these and all others of the sort, I will turn over to the heads of departments, and make them responsible for the good conduct of their subordinates.”7 It would not be that easy particularly for the office of Springfield postmaster for which friends and family competed. President Lincoln was often accused of excessive attention to patronage, but he understood as many others did not the importance of patronage in maintaining a political organization and political power. It was a lesson he had probably learned most pointedly when he sought the office of lands commissioner in 1849, only to see it go to a candidate who had not even supported his party’s nominee. President Lincoln “was fully, even keenly, aware of the role of patronage in building and maintaining a political party,” wrote historian William B. Hesseltine. “When rumor reached Illinois in 1849 that Zachary Taylor was about to appoint Justin Butterfield as Commissioner of the General Land office, Lincoln raised a hue and cry and wrote vigorously to leading Whigs to bring pressure on the president. 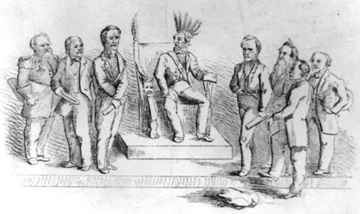 Butterfield’s appointment, he assured them, would be an â€˜egregious political blunder.’ It would dissatisfy, rather than gratify,’ the Whigs of Illinois. Butterfield was a ‘drone’ who had ‘never spent a dollar or lifted a finger in the fight.’ ‘Shall this thing be?’ he cried in anguish. “Our Whigs will throw down their arms and fight no more.”25 From that disappointing experience, Mr. Lincoln knew the dangers of political patronage mishandled. Unlike his critics, Lincoln understood politics was not practiced in a vacuum. Patronage was the oxygen that fueled a political maneuver; Lincoln learned that lesson when the administration of President Taylor virtually shut him out of any meaningful patronage role and virtually shut down his political career. Lincoln understood that Republicans in Congress may not have liked or respected him, but they usually needed him. Everyone, sooner or later, needed a favor. Patronage was especially important to cabinet officers. Therefore, it had to be important to President Lincoln. They were not shy about imposing their wishes on departments other than their own. Chase interfered in the War Department and criticized Seward for appointing an insufficient number of diplomats from Ohio. Well-placed patronage was one of the great advantages of the Treasury Department. Customs agents were the most lucrative positions, but Chase also utilized agents who worked with freed slaves and in collecting revenue. Although not all of his appointments seemed wise, they generally served his larger purposes. Lincoln biographer Carl Sandburg, “As an executive dispenser of patronage and offices, of favors and benefits, Lincoln had grown without ceasing in his instincts about where to give and where to withhold. As at no previous time observers and participants in the game of American politics hesitated at laughing over this or that appointment. They would look it over and study about it before they cared to say Lincoln didn’t know what he was doing so often had he fooled them.”41 Historian James G. Randall wrote that President-elect Lincoln “could not ignore entirely the well-established patronage rule of punishing enemies and rewarding friends. The pressure on him was too great. From November throughout the winter and spring jobseekers crowded into Washington in number inferior only to those of 1860-61. Some friends of Lincoln worried lest he, like Presidents Harrison and Taylor before him, suffer a physical breakdown as a result of his hounding by the spoils men. Despite his determination against a large-scale shift of officeholders, he had a number of political debts arising from the campaign, and he paid off many of them. Up to the day of his death in April 1865, he was busy with appointments of collectors of internal revenue and other such officers, sometimes making the appointments in batches. On the eve of his assassination he penned a note to the secretary of the treasury in which he said he ‘would like to oblige Gen. Schenck by the appointment of his nephew’ to a collectors’ job in California.”42 And Schenck, although an acquaintance from their service in Congress in the late 1840s, was not one of the President’s favorite congressmen. Historian Reinhard H. Luthin wrote: “In making appointments below Cabinet rank Lincoln also followed practices in keeping with American political tradition. The change in party control from Democrats to Republicans under Lincoln was the occasion for the most sweeping removal of federal office-holders up to that time in American history. He consulted members of his own party in the United States Senate in making nominations for or from their states. Minor offices were usually given to those men nominated by members of the House of Representatives. Fully cognizant of the power of the various states in national councils, he listened to recommendations from governors of the loyal states.”49 Mr. Lincoln’s thinking on patronage is revealed in a letter from the President to Secretary William H. Seward in mid- March 1861: “I believe it is a necessity with us to make the appointments I mentioned last night – that is, Charles F. Adams to England, William L. Dayton to France, George P. Marsh to Sardinia, and Anson Burlingame to Austria. These gentlemen all have my highest esteem, but no one of them is originally suggested by me except Mr. Dayton. Mr. Adams I take because you suggested him, coupled with his eminent fitness for the place. Mr. Marsh and Mr. Burlingame I take because of the intense pressure of their respective states, and their fitness also. The objection to this card is that, locally they are so huddled up – three being in New England, and two from a single state. I have considered this, and will not shrink from the responsibility. This being done leaves but five full missions undisposed of – Russia, China, Brazil, Peru, & Chili. And then, what about Carl Schurz? or, in other words, what about our german friends? Shall we put the card through, and arrange the rest afterwards? After his appointment as Minister to Great Britain, Adams began to thank the President when Mr. Lincoln interrupted: “Very kind of you to say so Mr. Adams but you are not my choice. You are Seward’s man.” He then continued the conversation by saying to Seward, “Well Seward, I have settled the Chicago Post Office.”51 Adams was appalled by the juxtaposition of the two appointments. The Chicago Post Office appointment was important, however – as the naming of John Locke Scripps to the post seriously aggravated another important Lincoln ally, Congressman Isaac N. Arnold. Mr. Lincoln’s skillful use of patronage paid dividends when President Lincoln sought reelection in 1864. Mr. Lincoln’s Republican adversaries were concentrated in Washington, while Mr. Lincoln’s patronage supporters were mostly back in their respective states. Historian William Frank Zornow wrote: “The President made use of his powerful patronage in securing the nomination. At nearly all the state conventions the office holders were always very active on his behalf. As the national convention approached the radicals found that the patronage was a power too difficult to overcome; especially when the guiding force behind its distribution was a master politician like Abraham Lincoln.”71The candidacy of Secretary of the Treasury Salmon P. Chase was killed by these forces as well as by the ineptitude of his own supporters. With the advent of the second Lincoln Administration in 1865 came a second rush for jobs. Historian Carman and Luthin wrote: “As in 1861, Lincoln himself was not left unmolested. From the time of his reelection to the even of his assassination Washington was filled with seekers of federal jobs who literally lay in wait for him. One witness of his second inauguration in March, 1865, sent word home from Washington:’Many persons are here from a distance, looking after their private interests, and seeking influence to assist them in the procurement of high as well as low positions. They do not seem to be mindful of the fact that there are to be no wholesale removals from place. '”72 Muriel Burnitt wrote: “Following Lincoln’s reelection in November, 1864, new troubles broke out within the party. In the creation of the complex, intricate, and bitter struggle between conservatives and radicals, rivalry for public office seemed at times to have been almost as potent a source of discord between the two main factions as difference of opinion over the Reconstruction policy to be adopted toward the crumbling states of the Confederacy. Michael Burlingame, editor, An Oral History of Abraham Lincoln, John G. Nicolay’s Interviews and Essays , p. 94. Charles Dana, Recollections of the Civil War , pp. 3-4. Richard N. Current, editor, Sections and Politics: Selected Essays by William B. Hesseltine , p.115. Michael Burlingame, editor, With Lincoln in the White House: Letters, Memoranda, and Other Writings of John G. Nicolay, 1860-1865, p. 31 (Letter from John G. Nicolay to Therena Bates, March 24, 1861). John G. Nicolay and John Hay, Abraham Lincoln: A History , Volume IV, pp. 68-69. Edward J. Kempf, Abraham Lincoln’s Philosophy of Common Sense: An Analytical Biography of a Great Mind , Volume I, p. 157. Charles M. Segal, editor, Conversations with Lincoln , p. 42 ( New York Tribune , November 20, 1860). Harry E. Pratt, David Davis, 1815-1886, pp. 81-82. Ward Hill Lamon, Recollections of Abraham Lincoln , pp. 27-28. Henry Clay Whitney, Life on the Circuit with Lincoln , pp. 186-187. Roy F. Nichols, The Stakes of Power, 1845-1877, p. 117. Margarita Spalding Gerry, editor, Through Five Administrations: Reminiscences of Colonel William H. Crook, pp. 30-31. Elizabeth Todd Grimsley, “Six Months in the White House”, Journal of the Illinois State Historical Society, October-January, 1926-1927, p. 48. William O. Stoddard, Abraham Lincoln: The Man and the President, p. 211. Michael Burlingame and John R. Turner Ettlinger, editors, Inside Lincoln’s White House: The Complete Civil War Diary of John Hay, p. 5 (Letter from John Hay to William Leete Stone, March 15, 1861). Alexander K. McClure, Lincoln’s Own Yarns and Stories , p. 139. Allen Thorndike Rice, editor, Reminiscences of Abraham Lincoln ,p. 50 (George W. Julian). Michael Burlingame, editor, Lincoln Observed: Civil War Dispatches of Noah Brooks, p. 211 (“Personal Recollections of Abraham Lincoln”). Michael Burlingame, editor, With Lincoln in the White House: Letters, Memoranda, and Other Writings of John G. Nicolay, 1860-1865, p. 30 (Letter from John G. Nicolay to Ozias M. Hatch, March 7, 1861). Michael Burlingame, editor, At Lincoln’s Side: John Hay’s Civil War Correspondence and Selected Writings, p. 125 (“The Heroic Age in Washington”). Michael Burlingame, editor, Inside the White House in War Times, p. 160 (White House Sketch #5). Michael Burlingame, editor, Inside the White House in War Times , p. 161 (White House Sketch #5). William B. Hesseltine,“Abraham Lincoln and the Politicians,” Civil War History, March 1960, p. 44. Allen G. Bogue, The Congressman’s Civil War, pp. 34, 35. James G. Randall, Lincoln the President: Last Full Measure, p. 297. Allen C. Guelzo, Abraham Lincoln: Redeemer President, p. 277. Douglas L. Wilson and Rodney O. Davis, editors, Herndon’s Informants , p. 206 (Letter from Robert L. Wilson to William H. Herndon, February 10, 1866). Emanuel Hertz, The Wizardry of Lincoln’s Political Appointments and Party Management, p. 21. Allen C. Guelzo, Abraham Lincoln: Redeemer President , p. 279. Allen G. Bogue, The Congressman’s Civil War, p. 31. Allen G. Bogue, The Congressman’s Civil War, p. 33. Allen C. Guelzo, Abraham Lincoln: Redeemer President, p. 363. Richard N. Current, editor, Sections and Politics: Selected Essays by William B. Hesseltine , p.120. Richard N. Current, editor, Sections and Politics: Selected Essays by William B. Hesseltine, p. 121, 118. Rufus Rockwell Wilson, editor, Intimate Memories of Lincoln, p. 255 (Richard Cunningham McCormick, New York Evening Post, May 3, 1865). Rufus Rockwell Wilson, editor, Intimate Memories of Lincoln, p. 255. (Richard Cunningham McCormick, New York Evening Post, May 3, 1865). Allen C. Guelzo, Abraham Lincoln: Redeemer President , p. 278. Carl Sandburg, Abraham Lincoln: The War Years , Volume IV, p. 133. James G. Randall, Lincoln the President: Last Full Measure , pp. 293-294. Henry Clay Whitney, Life on the Circuit with Lincoln , p. 422. Henry Clay Whitney, Life on the Circuit with Lincoln, p. 216. Francis Fisher Browne, The Every-Day Life of Abraham Lincoln, p. 485. Don E. and Virginia E. Fehrenbacher, editors, Recollected Words of Abraham Lincoln , p. 366. Michael Burlingame, editor, At Lincoln’s Side: John Hay’s Civil War Correspondence and Selected Writings , (“Life in the White House in the Time of Lincoln”), pp. 131-132. Charles Hubbard et al, editors, The Many Faces of Lincoln (Reinhard H. Luthin, “Lincoln the Politician”), p. 61. Roy P. Basler, editor, Collected Works of Abraham Lincoln (CWAL), Volume IV, pp. 292-93 (Letter to William H. Seward, March 18, 1861). Martin Duberman, Charles Francis Adams , p. 257. Henry Clay Whitney, Life on the Circuit with Lincoln, pp. 438-439. William H. Herndon and Jesse Weik, Herndon’s Lincoln , p. 435. Harry. J. Carman and Reinhard H. Luthin, Lincoln and the Patronage, pp. 335-336. Rufus Rockwell Wilson, editor, Intimate Memories of Lincoln, p. 606. Isaac N. Arnold, Life of Abraham Lincoln , p. 81. Harold Holzer, editor, Dear Mr. Lincoln , pp. 143-44 (Letter to J. K. Dubois, March 30, 1861). Hugh McCulloch, ”Addresses, Speeches, Lectures, and Letters Upon Various Subjects” , p. 43 (Address delivered at Fort Wayne, October 11, 1865). William H. Herndon and Jesse Weik, Herndon’s Life of Lincoln, p. 429. Rufus Rockwell Wilson, editor, Intimate Memories of Lincoln , , p. 33-34 (Letter from Robert L. Wilson to William H. Herndon, February 10, 1866). Harry. J. Carman and Reinhard H. Luthin, Lincoln and the Patronage , p. 334. Milton Henry Shutes, Lincoln and California , p. 222. Alexander K. McClure, Lincoln’s Own Yarns and Stories , p. 85. Henry Clay Whitney, Life on the Circuit with Lincoln , p. 216. Joseph Bucklin Bishop, Notes and Anecdotes of Many Days , pp. 65-66. Osborn H. Oldroyd, editor, The Lincoln Memorial: Album-Immortelles, p. 421. Henry Clay Whitney, Life on the Circuit with Lincoln, p. 185. Noah Brooks, Washington Lincoln’s Time: A Memoir of the Civil War Eira by the Newspaperman Who Knew Lincoln Best, p. 254. Michael Burlingame Editor, Inside the White House in War Times: Memoirs and Report of Lincoln’s Secretary: William O. Stoddard, p. xii. Charles Hubbard et al, editors, The Many Faces of Lincoln (William Frank Zornow), p. 98. Harry. J. Carman and Reinhard H. Luthin, Lincoln and the Patronage (New York Herald, March 6, 1865), p. 301. Muriel Burnitt, editor, “Two Manuscripts of Gideon Welles” , The New England Quarterly, September, 1938, p. 594. Francis B. Carpenter, Six Months at White House, p. 276. Allen Thorndike Rice, editor, Reminiscences of Abraham Lincoln,pp. 569-570 (John Conness). Harry. J. Carman and Reinhard H. Luthin, Lincoln and the Patronage, p. 301. Michael Burlingame, editor, Lincoln Observed: Civil War Dispatches of Noah Brooks, p.128 (July 23, 1864). James M. McPherson, editor, “We Cannot Escape History”: Lincoln and the Last Best Hope of Earth, p. 69 (William E. Gienapp, “Abraham Lincoln and Presidential Leadership”). Allen Thorndike Rice, editor, Reminiscences of Abraham Lincoln , p. 437 (Chauncey M. Depew). George H. Mayer, The Republican Party, 1854-1964, p. 109. John Russell Young, Men and Memories: Personal Reminiscences, pp. 54-55.